An MOU has been signed between GEC Trichur and ICT(Information and Communication Technology) academy of Kerala on 06.10.16. ICT academy of Kerala is a social enterprise partnered by Govt.of Kerala and leading IT companies with an objective of building employability skills amongst Engineering, Science and Technical institutes. Industry Institute Interaction Cell(IIIC) of Govt. Engineering College Thrissur(GECT), has great pleasure to announce the MoU signing cermony with the following prestigious industries in August presence of Dr. Kunjeria P Isac, Member Secretary AICTE on 18th Augest 2011. MoU between GECT and Steel and Industrial Forgies Ltd.(SIFL), Athani is signed by Dr. K Vijayakumar, Principal on behalf of GECT and Cdr. (Rtd) P Suresh, Chairman and Managing Director on behalf of SIFL. MoU between GECT and Bharat Petrolium Corporation Ltd. (BPCL), Kochi is signed by Dr. K Vijayakumar, Principal on behalf of GECT and Sri. Anujan S, Dty. General Manager(Technical) on behalf of BPCL(KL). MoU between GECT and Binani Zinc Ltd., Kochi is signed by Dr. K Vijayakumar, Principal on behalf of GECT and Sri. Roy Kurian K. K Chief Executive officer, Binani Zinc Ltd. Directorate of Technical Education, Govt of Kerala in association with BAT (Southern Region, Chennai), Confederation of Indian Industry (CII) and Technopark, Thiruvananthapuram is rolling out a unique opportunity for industries in Kerala. We have open up a distinctive industry-academia interaction program, for the benefit of both. Kerala is known for its brilliant and talented engineering students and a vast infrastructure of engineering colleges and other institutions. We propose to share this talent and infrastructure pool for the benefit of industries in Kerala, while promoting innovation, invention and practical education of our students. Industry Institute Interaction Cell(IIIC) of Govt. 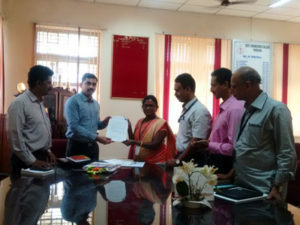 Engineering College Thrissur(GECT), has great pleasure to announce the MoU signing cermony with the following prestigious industries in August presence of Dr. Kunjeria P Isac, Member Secretary AICTE on 18th Auge st 2011. MoU between GECT and Sony Ericsson is signed . MoU between GECT and Infosis is signed . MoU between GECT and VHSC is signed . MoU between GECT and C-MET is signed on 12th Jan 2012. MoU between GECT and KELTRON CONTROLS is signed on 19th Mar 2012. MoU between GECT and TCS is signed on 3rd July 2012. MoU between GECT and FACT, UDYOGAMANDAL is signed on 3rd July 2012. Industry Institute Interaction Cell(IIIC) of Govt. Engineering College Thrissur(GECT), has great pleasure to announce that the signing cermony of MoU between GECT and TCS,FACT, UDYOGAMANDAL is over on 3 rd July 2012.